Designed by BrandOpus, United Kingdom. A taste of Rome, at home: BrandOpus bring The Stripes to PizzaExpress’ retail range. BrandOpus have created a striking new design for the PizzaExpress retail range. The new-look retail range follows on from the identity redesign, which saw BrandOpus unify and contemporise the distinctive PizzaExpress logo, placing it at the heart of a new visual identity, inspired by the black-and-white stripes of the shirts worn by the pizzaiolos in their restaurants. Now the agency has extended the redesign across a range of 47 products launching into selected supermarkets shortly. Edward Clark, designer at BrandOpus says of the packaging redesign, "The iconic PizzaExpress stripes are brought to life on pack, complemented by striking flashes of colour. This heralds a fresh and contemporary look for the range, whilst providing visual unity with the restaurant experience." 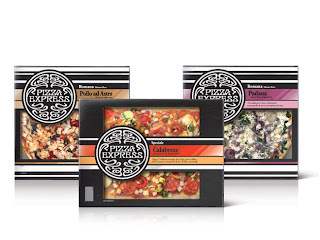 Beyond the vibrant new packaging design, the relaunch also sees eight new additions to the PizzaExpress retail range. A favourite in its restaurants, two Romana style pizzas will now be available in supermarkets for the first time. The Romana is famed for its bigger, thinner, crispier base, that allows the bold flavours of the fresh simple toppings to really jump out. The packaging design complements this with bold use of the black and white stripes with a dash of colour to reflect the key flavours of each variant. Inspired by one of PizzaExpress’ most popular restaurant pizzas, the Calabrese was created by Francesco Mazzei, chef of the acclaimed restaurant L’Anima. The design packs a punch too, with a piquant red and orange colourway reflecting the hot flavour. 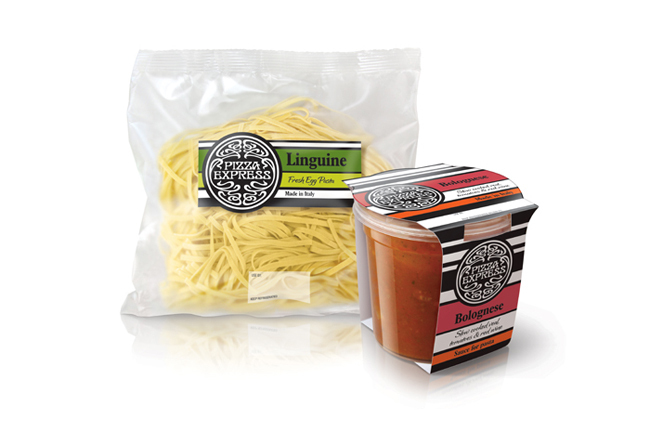 And for the first time PizzaExpress’ fresh pasta sauces will be available on supermarket shelves. Slow cooked in Italy with fresh Italian ingredients, the authentic flavours are brought to life on pack with flashes of colour between the iconic black and white stripes. 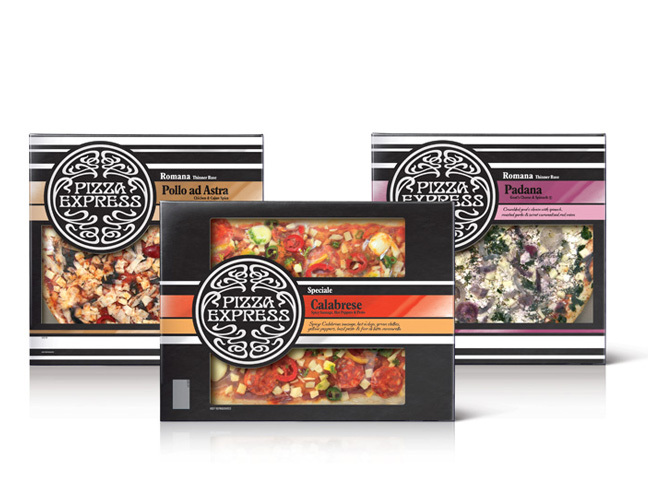 The redesigned PizzaExpress retail range will be available from May 2012 in selected supermarkets. I like the use of black color in packaging. It looks attractive combined with white letters and gradient colors.